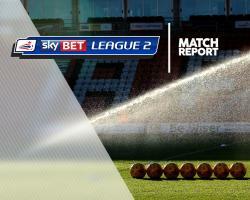 Brad Potts scored twice as Blackpool came from behind to win 4-2 against high-flying Doncaster in Sky Bet League Two. Rovers, unbeaten in four ahead of the game, struck inside the first minute as James Coppinger's cross was deflected into his own net by Andy Taylor. But Blackpool were level after 25 minutes when Potts was played through in the area and calmly slotted home. Gary Bowyer's side were ahead 14 minutes later as full-back Kelvin Mellor somehow looped the ball over visiting goalkeeper Marko Marosi from the right by-line. Midfielder Potts dispatched a thunderbolt of a free-kick into the bottom corner to make it 3-1 before Kyle Vassell broke and curled past Marosi from 18 yards. Darren Ferguson's side were offered a lifeline after 65 minutes when Tommy Rowe converted from the penalty spot after being fouled in the area by Jack Payne. Rowe had a chance to further reduce the deficit five minutes from time but his second spot-kick was saved by Sam Slocombe after the keeper had fouled John Marquis.